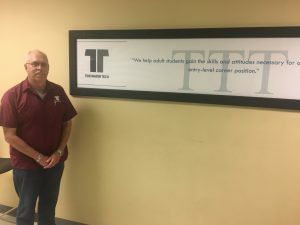 Posted August 31, 2018 by Tidewater Tech & filed under HVAC, Spotlight Feature, Tidewater Tech Trades, Trade School, Virginia. Wayne Sainio was born and raised in Maine. Out of high school, Wayne initially had an interest in being an architect and civil engineering. He joined the Coast Guard at the age of 28, serving for 31 years, and retired in August of 2013. “Well, forced retirement that is,” Wayne joked when talking about the time he served and when finally getting out of the service. Wayne has traveled all over, from Hawaii, Puerto Rico, the Great Lakes, Washington, DC, the gulf Coast states at least six times, Florida three times, and all over New England. Being Active Duty, Wayne received orders to report to his new station in Virginia, On June 3rd of 2008, and has remained in the area ever since. Wayne enrolled into Tidewater Tech’s HVAC program for the July 17, 2017 start date. When asked what brought him to Tidewater Tech after being in Virginia for so long, he replied that he had long been researching HVAC programs in the area. He expressed that he had been looking into trades programs that not only had positive reviews, but ones that were promising when it came to assisting graduates with obtaining employment in their field of certification. Wayne replied, “Tidewater Tech seemed to be the most promising program for what I was interested in. I heard this was one of the better places to learn HVAC and actually get a job. The big seller for me was that it was 4 days a week while others were 5 or more”. While talking about Wayne’s perspective on his program he stated, “The programs are great here. You have to be someone who can physically be here and who truly wants to learn the trades’ field. I wish younger kids would take this more seriously. Attendance is huge with these hands-on programs, they don’t realize it because they haven’t yet worked in the real world yet”. Wayne further stressed the importance of attendance and utilizing your resources, where there are so many not just of aid on campus, but in our local community. Additionally, Wayne discussed working in various positions over the years, citing his time as a maintenance pipe fitter over in Dam Neck, Virginia Beach, where he would assist technicians and vice versa, and how he “wondered what in the world they were talking about when they used certain terms, or why they would need to do that” when listening to the other guys at work talk and try to train him. “When I started the HVAC program everything really fell into place,” Sainio stated. “Things people had said and tried to previously explain to me over the years throughout various field related jobs, and had no idea what they were talking about, all started to make sense and I was able to better put things together…. HVAC is something that I had always been interested in learning and I really enjoyed the classes and it being hands-on instruction”. Additionally, in anything that someone takes on, whether it’s a personal, employment, or academic obligation or journey, it’s imperative to have a solid support system in place. Wayne discussed what a vital role his wife played in supporting him to go back to school and learn what he’d always been interested in, for his personal enrichment. “She (my wife) always encourages me to do whatever makes me happy, whatever it is, and that if I was interested in going back to school, then I should do it, and do my best”. Wayne discussed how a support system can really affect your goals whether its initially pursuing them or completing them, and disclosed that in a previous relationship when he wanted to back to school he was continuously questioned, put down, and told he shouldn’t, as where now he is encouraged, motivated, and rewarded for taking on this academic journey. On June 10, 2018, after 10 dedicated months of classes, Wayne Sainio graduated from the Tidewater Tech HVAC program with a cumulative grade point average of 4.0. During his time in the HVAC program, Wayne only missed two days of class due to “concert tickets I’d planned way in advance and couldn’t pass up on”. When asked what’s happened since graduating from the HVAC program, Wayne stated, It feels good to have the knowledge to trouble shoot AC’s and just help people out, and not working directly under someone. Even helping others at work.” Sainio continued with a story of an instance of this. “There was a time, not too long ago, where a customer question came up about a drain line, another individual who had worked in the field a long time shot down my response when I suggested the underlying cause, he was certain it was something else. Well, a week later that customer called back and let me know that I was right and they should’ve listened to me. So, it feels good to have the power of knowledge to help other people. It’s gone further than just personal enrichment”. When asked what he was doing for work, Wayne stated he is working with L3 Technologies at the Norfolk Naval Yard as the Lead Production Supervisor. He discussed the 45+ years of experience he’s had working in related fields; anything from shipbuilding to working on houses, and how the HVAC program really put the pieces together to educate him about the things he’s been doing for years, which is why he intends to further into the BMR program at Tidewater Tech. “I could get another job now if I applied, having the knowledge from my program to help in my interview, but right now I’m too afraid they’d say yes,” Sainio laughed as he discussed taking a break and completing the next program before seeking a job change. Wayne closed in discussing his feelings of accomplishment from completing the HVAC program and disclosed his excitement in taking on the BMR program. He made it clear that you have to be motivated to pursue your goals, and simply being there is always going to be half your battle.